The Colors Of Indian Cooking: Break Out The Shrooms. ...No, Not Those.The Meatless Ragu That's a Great Start To A New Year. Break Out The Shrooms. ...No, Not Those.The Meatless Ragu That's a Great Start To A New Year. This all started while making a vegetarian chili. I'd seen a great recipe for a quick veg chili in the New York Times and thought that would be perfect for a quick weekday workday lunch or dinner. I was planning on grinding and using the mushrooms for a chili con carne minus the carne sort of thing but I got so involved making a cornbread drop biscuit topping for the chili and I forgot. Yes, I forgot and then it was oh damn!!!!! I opened the fridge door and there were mushrooms staring at me. That's when I thought I'd use them the next day in a different recipe which is exactly what I did. 1/2 tsp of dried oregano or fresh if you have it. 3 Tbs of olive oil. Put a pot of lightly salted water on to boil for the pasta. Place the crimini mushrooms in a food processor a bit at a time and pulse them until they resemble coarse hamburger texture. When the oil is hot add in the chopped onion and a pinch of red pepper and some chopped basil and the oregano. When the onion is translucent and everything is aromatic, add in you chopped mushroom "hamburger." Saute it lightly until it darkens a bit. Now add in the chopped tomatoes and the white wine. Raise the heat till the tomato mixture starts to simmer, and then let it cook like that for about 20 minutes, until the chopped tomatoes start to break down, and the wine starts to evaporate. When the sauce has thickened, add in your tomato paste, salt and pepper to taste. Put your pasta into the water you have boiled and cook it until it's al dente. When the pasta has cooked, drain it and save the pasta cooking water. Put the pasta into the mushroom ragu and add in 1/2 cup of pasta water. Stir everything together and cook until the water has absorbed. Dish it up and top with some grated cheese. Meanwhile on the doggo front we are settling in with our new adoptee, Tyrion. Since he is 3 years old and used to that name we're not going to change it. Also, we're #GOT fans so....what can I say. He's definitely making himself at home. He is not supposed to be on that blanket btw but try telling him that. he sleeps like a typical Husky. 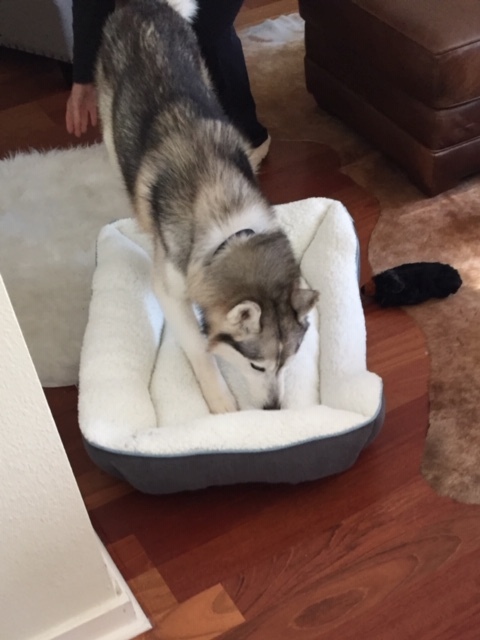 We bought him another bed for the family room downstairs. ...but he still likes that couch.